Featured here is an overview image courtesy of Google Earth. 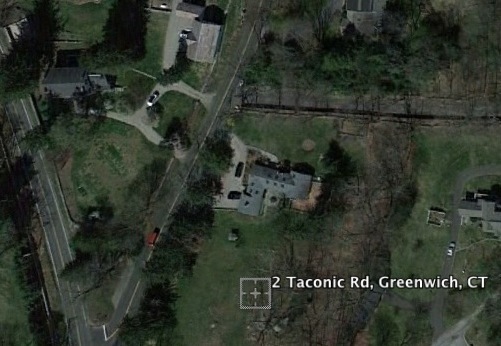 The image is of the area around the intersection of North Street and Taconic Road, Greenwich, Connecticut. Taconic Road is the road that bears to the right and up toward the center of the image. If you look closely above the house in the center of the image the outline of the cemetery plot can be seen. Adjacent to it is the stone wall that goes from the street. The original family homestead, barn and other buildings built by Caleb Mead is in the upper left of the photo. The image featured here comes courtesy of Google Earth. The date of the image is March 30, 2012. 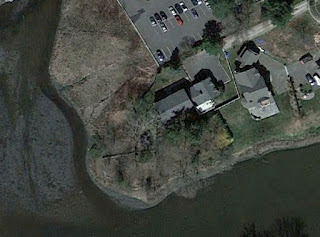 Pictured here is the family plot located off Relay Place, Cos Cob and the Mill Pond. The parking lot is in the rear of the Mill Pond Shopping Center off East Putnam Avenue.